Your organization functions like a complex machine with numerous ancillary components working in tandem. To sustain the overall efficiency of the system, the frictionless operation of contributing elements is compulsory. Employee productivity, measurable by output per man hour or shift, is an integral element of this system. Unmanaged employee leave and unauthorized absence from the workplace can cost your organization’s bottom line dearly. As such, investment in leave management would be a prudent decision whose advantages would make themselves apparent within relatively shorter time. Why should you invest in leave management? If you are still vacillating over whether to invest in leave management or not, check these 10 compelling signs to understand your organization’s risk exposure level. If productivity is not at par with the benchmark or aspirational level, it is high time that you sit back and analyze the reasons. Employees may be proceeding on leave erratically, letting critical jobs suffer. Since the manual process of tracking leaves of individual employees is cumbersome, vital corporate functions would always be behind the target. Wages cost is running high. Why? Because manpower engagement for each job vertical is high and above approved standard force. This may be because employee deployment matrix is getting repeatedly violated due to shabbily tracked leave and presence records. Few employees may be registering their attendance on registers and then surreptitiously leaving workplace causing organizational work to be hampered. Labour laws in our country are getting more complicated and comprehensive by the day. Any non-compliance can land your organization in serious trouble. If your organization is running into legal hassles frequently because employees, either tenured or contractual, are lodging complaints about leave related irregularities, the time is opportune for embracing a leave management system. If important projects are getting extended beyond committed deadlines, it can be due to non-automation of workforce management. Availability of key team members cannot be ensured simply because you have no concrete leave scheduling system in place. Factory laws stipulate making payment to employees who opt for cash against paid or privilege leaves not availed off. Also, at the time of separation or retirement from the company, employees encash all remaining leaves. If you cannot diligently monitor the leave balance of staff and thus, subject the Accounts department to huge cash liability suddenly, then leave management system is certainly beckoning you. Investment in leave management is also important to keep employees motivated. Disgruntled employees present in the office often fail to deliver 100% of their potential. If your staff members are not getting leaves at times when they have personal exigencies to attend to, the purpose of leave would be defeated. Leave approval process can be streamlined with an automated system. If your organization is hiring tenured attendance recording personnel just for registering attendance and managing leaves manually, then it is a sorry state of affairs as per present industry standards. 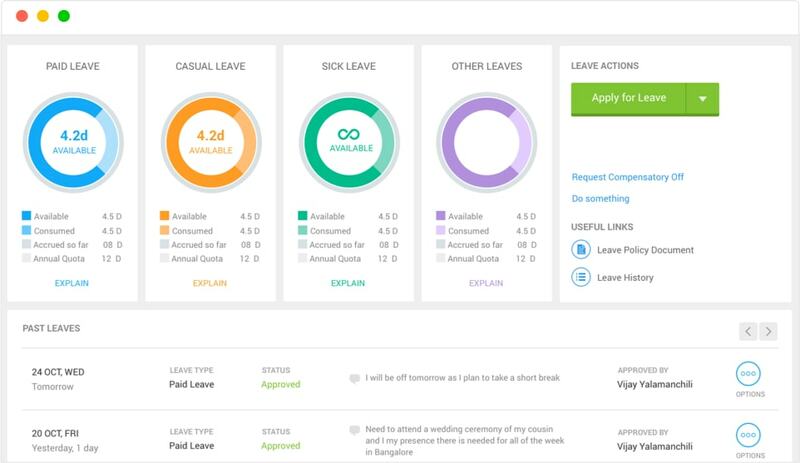 Automated leave management system can meticulously track leaves and also provide comprehensive reports instantly. The manual system is prone to errors as well as deliberate botching up. You might have heard that leave clerks often seek gratifications from employees to misrepresent actual leave data. This is really serious as your company is paying employees handsomely. With leave management system, no such foul play is possible. Leave management system is needed to seamlessly allow easy, hassle-free, error-free, and streamlined leave policy enforcement uniformly without any irregularities or discrepancies when the strength of staff in your facility has grown up significantly. Financers and clients, in present times, tend to pose their belief in those firms that have embraced contemporary technology. This is also an indication of the organization’s ability and intent to maintain its competitive edge in the market. Without an automated leave management system, your reputation is getting maligned. Modern leave management systems are technologically very advanced and sophisticated. Making a conscious decision to invest in them would boost your bottom line significantly.